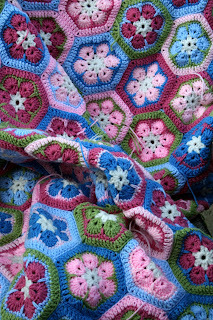 http://byelizabethcat.blogspot.com/2010/05/double-edging-now-know-how.html I saw this african flower project and knew I had to use these colors for a blanket. Its all put together and has a double border..Only a few of the ends have been sewn in.Seems like there are a million ! LOL ! My 18 year old wants a red white and blue blanket so I am making this ripple for him. Not very far yet ! http://yarn-ing.blogspot.com/2009/07/granny-square-pattern.html I saw this pattern yesterday and started it.It might be a gift , still have to decide ! Thanks for looking ! Wow your african flower blanket is absolutely stunning. The colours are beautiful. I am sooooo jealous! 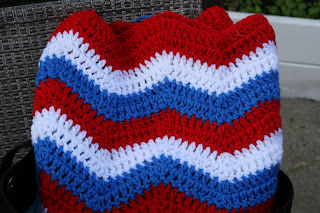 Beautiful blanket! Very nice colors. 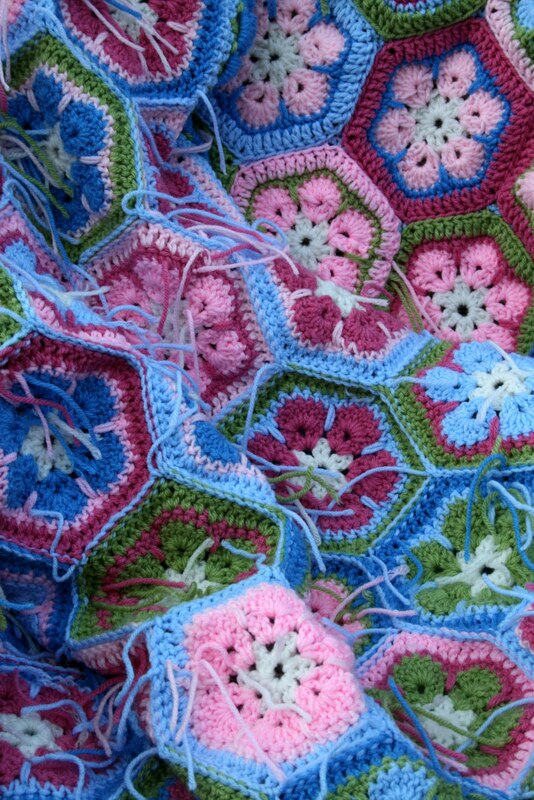 I popped on over from I crochet and I'm loving your blanket! Beautiful colors. Wow!!! I absolutely love your African Flower blanket. It is totally gorgeous! 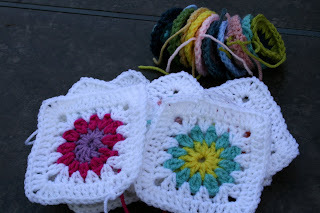 I can't wait to make one - I have only just learned how to make African Flowers a few days ago. Muy bonita tu manta,me gusta mucho. Hi, I love your African Flower Blanket!! I have just learnt how to crochet and I'm in the middle of making a granny squares blanket. 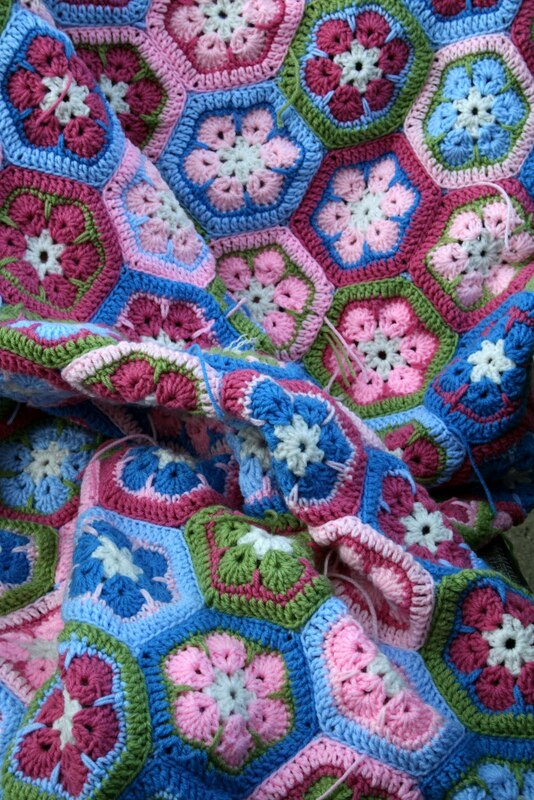 Think my next blanket will have to be one like yours!! 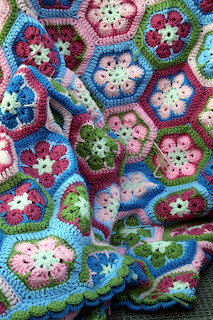 Love your african flower blanket! Wow! these blankets are wonderful. love the african flowers, how lovely! Awesome, i am always looking for new ideas. This is beautiful and unique. May I ask how you put these together? I'm in the process of making one and I haven't been joining as I go. How do you join 3 of them together if you haven't been joining as you go? is there a quick instruction on doing a single version of that yummy border? How do you view http://byelizabethcat.blogspot.com that is referenced in your post? I see a lot of people posting links to that blog but it says by invite only. Do you know how to get an invite? The jars are great and the African flower blanket is just beautiful, the colours you have chosen go together perfectly and bring Africa itself to mind. Well done.